Most urban houses which had kitchen gardens a few decades ago, have developed into residential or industrial premises to satisfy the growing population. The land value also increased multifold and the concept of garden has taken a back seat. Cities have become concrete jungles. The numbers of people growing crops are dwindling and the population in urban areas has increased multifold. The high demand and pull for perishable fruits and vegetables to cities has led to malpractices, toxic agriculture and processing interventions, unexpectedly high costs and many related problems. Consumers are becoming more aware and realizing the health hazards due to the food they consume, due to higher levels of toxic pesticide residues, which affect not only health but also the subsoil water and environment. City dwellers are completely dependent on produce from villages and peri-urban areas are facing the heat and have to look for alternatives. The alternative is to adopt the space available on the roof tops/terraces, to have a garden, for cultivating fruits and vegetables. Terrace gardening is a simple but definite step towards increasing our green cover irrespective of space restriction. This is an option yet achievable activity for many urban dwellers to cultivate the food crops of their choice. This felt need can be a real movement by sharing and spreading know-how amongst us. However, the learning has to happen experientially because of diverse needs and other growth situations. Another event of ‘Oota from your Thota‘ is organized at Triangle Park, Sadashiv nagar, Bengaluru on 24 February 2013 from 10 am – 5 pm. It will be a must visit event for all urban farmers and garden enthusiasts to cater their needs of terrace gardening or urban farming. Click here for more details. The importance of urban farming in general and terrace gardening in particular has been recognized and support systems are being planned to encourage and to explore further. Many organizations and individuals are joining hands in promoting the concept and practices of organic terrace gardening among city dwellers through training events, workshops, popular articles, online sharing, blogs, and so on. Garden City Farmers, Vittal Mallya Scientific Research Foundation (VMSRF), AME Foundation (AMEF), Association for Promotion of Organic Farming (APOF) in Bengaluru, to name a few. 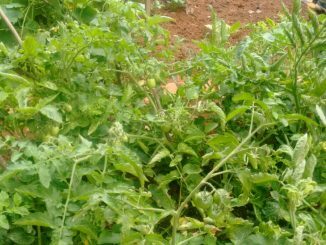 When it comes to real practice of Terrace gardening or urban farming, all those who are interested in growing vegetables following safe crop production practices, look for different types materials and inputs in one place. Garden City Farmers have been organising the event ‘Oota from your Thota’ from 2011 across Bengaluru with a purpose to promote Organic Urban Farming/Organic Terrace Gardening among urban dwellers, making available all gardening related materials in one place along with knowhow. The event is to expose the urbanites to different enterprises related to organic urban farming. The event will have demonstrations/discussions, film shows and exhibitions on organic urban farming, inputs and products/foods. What started off as personal interest, has now become a zealous drive to encourage more people to take to organic gardening. Meet Vinay Chandra, the man with the mission. Growing crunchy carrots, cabbages and brinjals in your own gardens is not as hard as you think. Here’s a quick guide on how to grow your own vegetables, this winter.